Last year we had the privilege of meeting with a couple of great companies to talk about the future of energy. The lessons these meetings provided really stuck with us, and we’ll continue to keep them in mind as we move into 2018 and beyond. The first company we met with is an international consultancy focused on innovation and redefining what it means to be an energy company. The second is a smart and innovative large company whose primary product is insurance (well, it has a lot of products and services, but that’s the big one), and guess what they wanted to talk about? Energy and innovation. The connected customer. Big data and customer experience. 1. The future is in the solutions. At KSV, we’re often thinking about what the energy company of the future looks like. We’re not sure we have the answer, but we know that it isn’t close to what it is today. This is no longer a “pipes and wires” business alone. It’s being led by disruption, innovation, products, and solutions. In one of our meetings we discussed the upcoming “lighting cliff,” and how everyone, but especially those responsible for commercial lighting programs, must begin preparing and getting innovative, fast. We’ll need deeper solutions with greater savings, and customers who understand the benefits of deeper EE, so they’ll trust in the advocates and prioritize the actions. 2. The customer must be at the center of everything we do. Whether you are redefining what it means to be an energy company, acting as a trusted advisor to organizations and individuals on how to best use energy, or working at a renewable company that is changing the world, the most important task of your job every day is to consider the customer experience you are creating. How can you make it easier, faster, and better to do business with you? In our second meeting, we discussed the need to meet customers where they are, not where we want them to be. 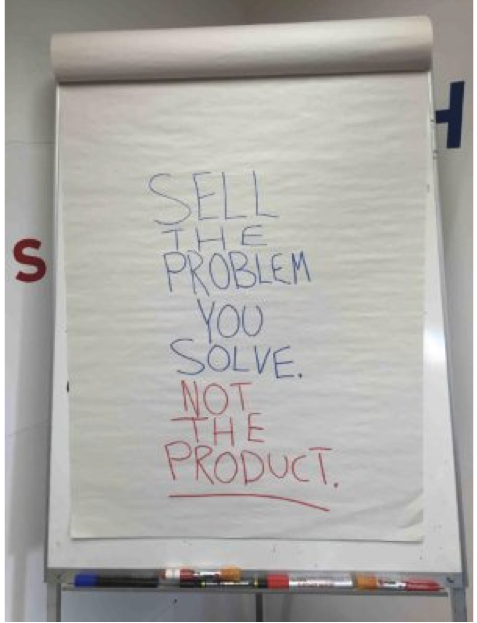 And then once we’re there, we have to sell the problems we solve, not our products or (god forbid) our process. Whether you’re selling consultation and innovation, SaaS products, or the most beautiful Wi-Fi thermostat in the world, you must be relevant to your customers. Their pain points, challenges, and frustrations are your opportunity. And if they aren’t yours, they will be your competitors’. 3. We must innovate or die. KSV has been in business for 40 years, and over those four decades everything about the business has changed (well, everything but the beer fridge. That’s always been here and always will be, hallelujah). So often, we have conversations with clients who are struggling with what the change in their industry means for their own company. What we have learned, and what we heard loud and clear, is that legacy, infrastructure, even industry is no excuse for not innovating. The best, most impressive companies (and the two we met with definitely fit this category) are innovating in ways that we are inspired by, and they are doing it at supersonic speed. They aren’t interested in re-creating the wheel, building off successes they’ve already attained. Someone else can chase that, and re-create the wheel that these guys built. Instead, they are forging new ground, looking for new products, new services. They are focused on innovation, on the next great idea, on changing what it means to work in the energy industry. Energy is the future. And we feel confident these companies will be there to meet it. Oh, and if you happen to work at one of these two companies, thank you. Thanks for great conversations and for inspiring us, and everyone else in the industry. You got our minds racing, and we’re still thinking about it. So, bring it on, 2018—we’re ready to get started. Ashley Nicholls. A.K.A. KSV’s Executive Director of Client Services and Strategy, energy marketing wizard, ‘nuff said. Read more from Ashley here.